No, not happiness and sadness, up and down the hill between Naivasha town and SFG. Made the round trip so many times the car practically steered itself! Up early to get to school by 8:30 to teach the form 4’s. They had asked about surds, which are square roots that are not whole numbers, like root 3, or cube roots, 4th roots and so on. It’s not a hard topic, but they didn’t know much about them, so we began. Then run down the hill to pick Joyce, whom I had suggested for sewing school badges on uniforms. When the students went home for midterm break they were given the badges and told to have them sewed on. However, the girls who were “retained” didn’t have that opportunity. Hence Joyce. I had to drive down to the main part of town, then on the very bumpy, potholed road to her house. She has a very old, foot treadle Singer, in a hardwood table and made of steel. The kind that lasts longer than the user and weighs as much. She and a neighbor hoisted it into the boot and off we went—but oh, I needed to stop at a Safaricom shop, of which there are many, to reload my modem, Maya having used us $60 worth of credit doing Skype and Facebook while she was home on midterm break! ARGH! I hadn’t realized how much time she had spent on that this weekend and I had also not understood how expensive it would be. I had loaded on ksh 5000, which I figured would last the summer, and this morning I had zero credit! It’s not her fault, she didn’t know, but I had to buy more credit, so I thought I could stop by the shop where David Mungai (see #6) works, right on the way back to school. Alas, it is only a small shop and the biggest credit they carry is ksh 20 credit chits (about $.25) When you load credit, you have to key in 16 digits. Imagine doing that 80 times! No, I guess I have to go to the big Safaricom office, where any transaction takes at least ½ an hour if it isn’t complicated. Complications take longer. ARGH!! So on up to school where we get Joyce set up in the library to sew. It’s teatime, so I bring her tea and a mandazi-deep fried dough and yummy. Now I have no time for my tea and mandazi, but I’m peckish, so I ask Peter whether it’s ever permitted to drink tea and eat in class. “You can get away with a lot of things the rest of us can’t – but they’ll laugh at you.” I took that to be a yes, and yes, they did laugh, but I got my tea and goodie. It was form 4 again, working on harder surd expressions. I was glad I had 1 copy of the book we use at MA, b/c it has better problems. I’m not sure everyone got everything, but I think enough of them did that they’ll explain further to the others. Now it was 12:30. I had to go back home to see to Maya, who was to report back today after mid-term break. Woe unto anyone who arrives even 1 minute after 4 pm!!! We decided she could be accompanied by the other girls from Mji Wa Neema, partly so she could experience returning to school and walking down the dusty road from the highway and partly b/c I had promised to meet someone on an important assignment—story to follow. Jane is a graduate of SFG who qualified for the low cost admittance to university. Very bright, but a poor and totally dysfunctional family. Her admission papers got delayed so she couldn’t begin in September. She found a room to live and started a small business. Coming home at dusk one night she was jumped and gang-raped. OH, God! Why does that have to happen, especially to this girl whose life has been so hard until she came to SFG, where she thrived. She just hermitted herself for some time, trying to deal with the trauma. Eventually Peter Murigi was able to contact her. Her admission papers had finally arrived and he had been calling her for several weeks. She came to school and told him the whole story, including the fact that she was pregnant! She chose to carry the child and will keep it, so my appointment was to buy baby things for her, compliments of her very generous sponsor, who has really supported her. We bought “nappies”, and plastic covers, soaps, lotion, a baby bath tub and food for her. We planned to go to the local outdoor market, where virtually anything can be purchased at very low prices. But by the time we got through the checkout I discovered I had used up all my cash. No credit cards there! In fact, I was scrambling for enough shillings. She shyly handed me all she had, which was ksh 55 (about $.65), which I was about to accept, when I discovered ksh 300 ($3.75) in my pocket. “I’m rich!” everyone in the “queue” behind us laughed at the mzungu” who was excited about a mere ksh 300. We piled everything into the car, went down to Safaricom, where they had completed loading my credit on the modem and off to Jane’s house. ARGH! Down potholed, rutted lanes, left here, right here, until we came to a small series of 1-room residences. We carried in all the goodies and food. She was exhausted but relieved that we had got purchased what she needed (almost). She is due in 3 weeks, but feared it might be sooner. If we don’t make it to the other market before she delivers, her very sweet sister, come to stay for the first month, will go with me to get the rest of what she needs. Now back up to school to pick Joyce and the machine to bring back to her house. Every time one is on the road through Naivasha, going up to the highway and to school, there are impediments, donkey carts pulling 50-gallon barrels of water, hand carts delivering heavy loads, pulled by one man and pushed by another—back-breaking work. There are the matatus, pulling off and on the pick or disgorge passengers, overloaded trucks belching black smoke in the faces of those behind, piki-pikis darting in and out of traffic (small motorcycles used as taxis) people running across the road. I have to totally concentrate on front, 2 sides and back (to be aware of someone more lead-footed than I who might be “overtaking”). It’s exhilarating but scary to drive here—definitely not for the faint of heart, but no one ever accused me of that! Driving on the dusty road from the highway to SFG I see girls returning from break. Most have arrived by matatu and are walking down to the school, carrying personal supplies they’ve purchased for the remainder of the term. I stop and let 3 of them climb in the back. Giggles and titters. We drive in the gate, where girls are lined up first with the gateman who checks to be sure they are our students, then with a teacher who checks something else, not sure what, then to the chemistry lab where the women teachers are searching bags, backpacks and bodies for contraband. Even though the girls know this search will happen, they try to sneak in goodies. One girl had her underwear and pockets filled with sweets. Maya had endured that earlier and was again put off by having all her things pawed through. It’s all part of the drill here, not just at SFG, but at every boarding school. 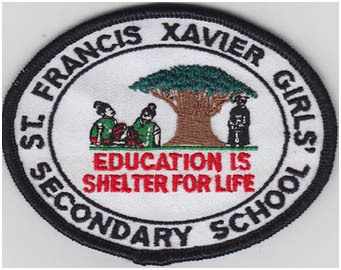 Joyce had just finished sewing on 80 patches, which meant a nice piece of change for her. She is a single mom with an adult son, daughter in form 2 and daughter of her late sister in form 1. 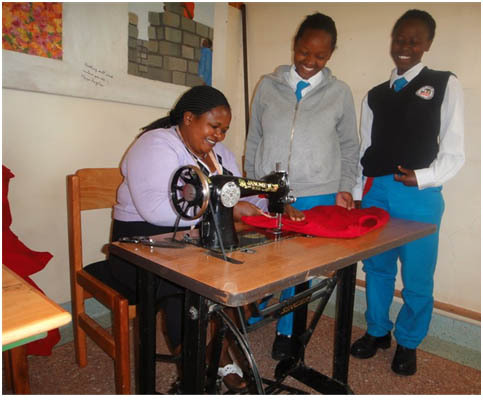 She supports them and pays school fees by her sewing business and was really grateful for the opportunity to earn some shillings. She is the designer and maker of the bags and totes I bring home (more about that in a future EM) Note the mural on the wall behind her, designed and executed by the Kenya Help girls who some years ago raised over $40,000 for SFG. Two strong girls carry the table back to my car while Joyce lugs the machine. Maya gets settled, girls are hugging each other, glad to be reunited and school is again humming. Joyce and I drive back down to the town, back over the rutted, potholed road to her house, where she enlists the help of a neighbor to carry in the machine. I finally return to the parish compound promising the gateman this is the very LAST time today he will have to swing those wide, heavy panels to admit my car. I park, gather up whatever from the back and notice an empty soda bottle and a paper full of chips left by my graceless passengers. So much for offering a ride. I toss the bottle in the trash and take the chips to add to the fare of the pigs. One of the ways Jecinta supports the children’s home is by raising pigs, in a small stye at the edge of the parish compound. Food waste from Mji Wa Neema, as well as the rectory and the small convent within the compound, are used to feed the pigs. A very large vat in the kitchen at the back of the children’s home serves as a collecting space, where everything is dumped and then cooked. It’s most uninviting to the eye and nose, but Julia assures me the pigs love it. I added my own contribution, some watermelon rinds and several tomatoes that didn’t get eaten in time, as well as the small bit of hamburger I had intended to add to last night’s leftover soup. ARGH! It was too old for my nose, but not for the pigs, according to Julia. As I chat with Julia and Agnes while they prepare the children’s dinner, Joseph (pnb-boy) comes in. Julia had sent him for his exercise books, which she checks each night. This boy has really come around, thanks to the pnb he gets in the afternoon if he has a good report from school. Almost all the exercises he has done are wrong, but at least he is doing them, instead of tossing the books and claiming he has no work. I had suspected he had a good report when I first saw him and he didn’t look down and try to run away. He had even taken his shower w/o being told. This is the same wretched child who just last year refused to wash and when taken by the bigger boys to shower would scream bloody murder, despite their very gentle washing of him. Who knew pnb was such a cure-all? Having no hamburger to add to my soup, I cast about for something for dinner. Aha! That avocado Maya and I bought in the street market looks ripe and there are some not-too-old tomatoes. I have bread and cheese. A sandwich! I toasted the bread in a pan to melt the cheese, then added slices of perfectly ripe avocado and tomatoes. Despite having no mayo, it was delicious and filling when topped off with some watermelon. Life is good.